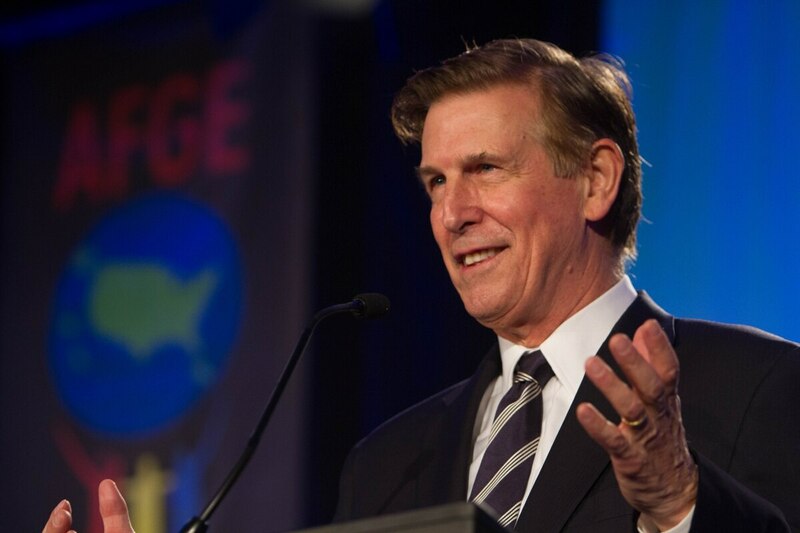 US Rep. Don Beyer appears at the American Federation of Government Employees's legislative conference in 2015. WASHINGTON — If there’s a U.S. government shutdown, dozens of lawmakers want to make sure federal employees receive retroactive pay. Democratic Rep. Don Beyer and Republican Rep. Rob Wittman, both from Virginia, have introduced the Federal Retroactive Pay Fairness Act, meant to blunt the impact of a federal government shutdown on federal workers. Maryland Democratic Sen. Ben Cardin, whose state is home to more than 130,000 federal government employees, has offered a similar bill in the upper chamber. With lawmakers seemingly deadlocked on a stopgap continuing resolution to fund the federal government, Beyer and Wittman were gathering support on the House floor Thursday afternoon. Together, the two represent nearly 120,000 federal employees. Unlike what the name suggests, the federal government doesn’t fully close during a government shutdown and employees generally face one of three outcomes as a result: furloughed, excepted or exempted. Absent congressional action, appropriations for the federal government will expire on Friday, triggering a partial government shutdown. To be clear, uniformed troops—considered contract employees— will report to their posts. Government agencies such as the Coast Guard, FBI, National Security Agency and Transportation Security Agency, will continue operations. Certain “excepted” federal employees would be asked to work without pay until an agreement is reached, while 800,000 would be furloughed without pay. “In the absence of such an agreement and with time running dangerously short, federal employees should be assured that there is agreement in Congress that they will receive their full pay in a fair and timely manner,” Beyer and Wittman said in a letter to colleagues. Beyer told Defense News he expects his bill—modeled after a law related to the 2013 shutdown—to pass, if it’s needed. “(Lawmakers) will occasionally rail against nameless, faceless bureaucrats, but I don’t think there’s any real animus against our federal workforce,” Beyer said. Cardin noted that a shutdown would have an oversized impact on American veterans, as more than 30 percent of federal workers are also veterans. Cardin’s bill has 22 cosponsors, and none of them are Republicans. The House bill has 26 cosponsors, with Wittman and Rep. Barbara Comstock, R-Va., the only Republican cosponsors. Virginia Democratic Rep. Gerry Connolly, the House Government Operations Subcommittee’s ranking member and one of the House bill’s cosponsors, said its path was not guaranteed. “That’s always a risk with a conservative Republican majority who doesn’t like government to be begin with, and therefore has no fidelity to the men and women who serve it,” Connolly said. In the Virginia suburbs of Washington, D.C., where countless government employees and contractors live, the last shutdown cost $217 million per day to the local economy, Connolly said. The American Federation of Government Employees and the The National Treasury Employees Union welcomed the Beyer-Wittman bill. “These employees do not control the funding of the federal government and should not suffer when that funding runs out,” said NTEU National President Tony Reardon.